Ingram secured two tackles and a pass deflection Sunday in the Chargers' divisional-round playoff loss to the Patriots. Analysis: Not surprisingly, Ingram put together the majority of his 2018 production during Joey Bosa's (foot) 10-game absence, tallying five of his seven sacks without the star defensive lineman on the field. 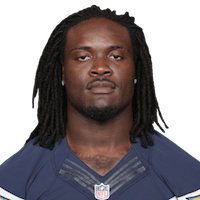 Two years into a four-year extension signed back in 2017, the majority of Ingram's dead cap penalty will come off the books next season, but the Chargers aren't expected to cut their productive defensive lineman without any means of improving upon the position. Ingram had three (one solo) tackles and 1.5 sack in Thursday's win over the Chiefs. Analysis: It's Ingram's first sack since Week 10 at Oakland and brings his season sack total to seven. 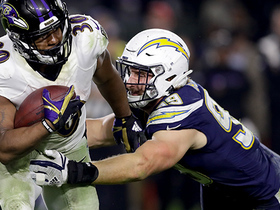 The 29-year-old has 39 total tackles, one forced fumble and one interception through 14 games, and has a matchup against the mobile Lamar Jackson and the Ravens next week. Ingram recorded four tackles (three solo), a sack and a forced fumble across 55 defensive snaps in Sunday's win over the Raiders. Analysis: Ingram has stepped up his level of play in recent weeks, as he now has four sacks over the past five games. 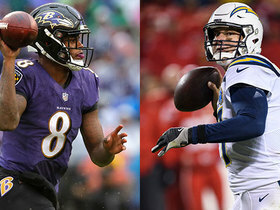 The veteran could continue to see growth with Joey Bosa (knee) nearing a return, as the duo ravished offensive lines last season. Analysis: Ingram has fared well despite the absence of Joey Bosa (foot), tallying two of his team-leading 4.5 sacks in the past two weeks. The veteran pass rusher should see a significant boost in the coming weeks as Bosa should be ready to make his 2018 debut in the near future. Ingram recorded five total tackles and one sack during Sunday's 20-19 win over the Titans. Analysis: After logging only one tackle against the Browns last week, Ingram's numbers normalized during the London-based contest. Ingram now has 3.5 sacks on the season, and continues to excel as a pass rusher. The veteran could benefit from the return of Joey Bosa (foot) in Week 9 following the Chargers' bye week. Ingram led the team in tackles with seven (five solo), tallied one sack, two tackles for a loss, one interception and one pass defended in Sunday's 26-10 win over the Raiders. Ingram recorded four tackles (three solo), including 1.5 sacks, in Sunday's 31-20 win over the Bills. Analysis: Ingram had a poor showing in Week 1 against the Chiefs, securing just a single tackle. His 1.5 sacks are more in line with what we've come to expect from him over the past three years, where he's averaged over nine sacks per season. He'll look to get after Jared Goff in Week 3 as the Chargers face off against the Rams. Ingram participated in OTAs on Monday, Eric D. Williams of ESPN.com reports. Analysis: Ingram was absent from the first week of OTAs while he remained in Florida to do some individual workouts, and his return this week will give him the opportunity to work with teammates before the start of the team's mandatory minicamp. He's coming off a strong 2017 campaign where he posted 10.5 sacks, which matched his career high. Ingram didn't show up for OTAs on Tuesday, Eric D. Williams of ESPN.com reports. Analysis: Instead, Ingram stayed in Florida to get ready for training camp that will start in late July. These are voluntary workouts, so Ingram's merely missing out on an opportunity to gel with new teammates. Ingram has racked up 29 sacks in the last three seasons and will start opposite Joey Bosa on a dangerous defensive front. Ingram recorded a half of a sack as well as three tackles (two solo) in the Week 17 win over the Raiders. He finishes 2017 with 56 tackles, 10.5 sacks, one forced fumble and two fumble recoveries, one of which went for a touchdown. Analysis: The 10.5 sacks tied a career-high mark for Ingram, as the 28-year-old came on strong to end the season, tallying two sacks in the final four weeks of the campaign. Alongside dominant edge rusher Joey Bosa, Ingram figures to be in prime position to repeat his performance in 2018. Ingram registered five tackles (three solo) and a sack in the 30-13 loss to the Chiefs on Saturday. Analysis: The sack was Ingram's second quarterback takedown in as many weeks, with the sixth-year edge rusher largely ceding sack opportunities to pass-rushing mate Joey Bosa. After a torrid start to the season, Ingram has tailed off considerably, to the point where he remains a risky IDP option most weeks. However, with Bryce Petty and the Jets on tap for Week 16, it wouldn't be unreasonable to suggest Ingram makes it three straight weeks with at least half a sack. Ingram picked up one tackle and returned a fumble for a touchdown in the 54-24 win over the Bills on Sunday. 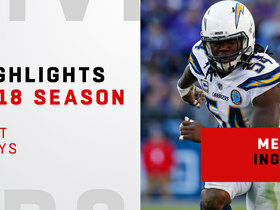 Analysis: Ingram's production has slowed following a torrid five-game stretch to begin the season, but he's still performing exceptionally well opposite standout pass rusher Joey Bosa. With a two week stretch against the Cowboys and Browns next on the schedule, Ingram remains an intriguing IDP option in all formats. 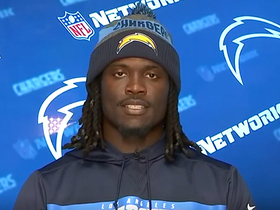 Los Angeles Chargers defensive end Melvin Ingram discusses his rapping skills, and which Chargers player he believes is also a talented rapper. 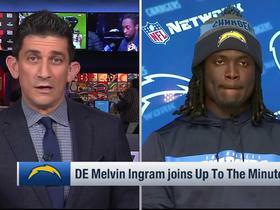 Los Angeles Chargers defensive end Melvin Ingram joins "Up to the Minute" to discuss their Week 16 games, playoffs, Pro Bowl and more. 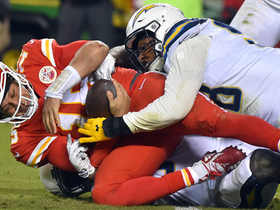 The Los Angeles Chargers defense collapse the pocket for a major sack on Kansas City Chiefs quarterback Patrick Mahomes late in the game. 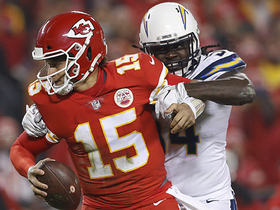 Los Angeles Chargers defensive end Melvin Ingram flies off the edge to sack Kansas City Chiefs quarterback Patrick Mahomes. 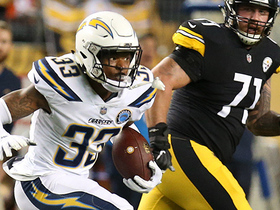 Los Angeles Chargers Derwin James picks off Pittsburgh Steelers quarterback Ben Roethlisberger on a good read. 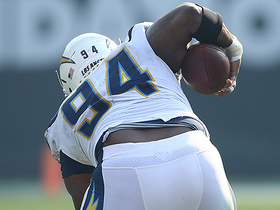 Los Angeles Chargers defensive tackle Corey Liuget is quick to scoop up the fumble, after an Oakland Raiders quarterback Derek Carr strip-sack, and take it 24 yards. 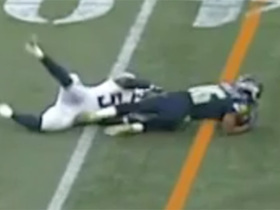 Seattle Seahawks wide receiver Tyler Lockett makes a diving catch for 9 yards.